Six thousand years ago woodland covered most of England, sometimes known as wildwood. Our hunter-gatherer ancestors made little impact on the wildwood, but when people began to settle down and practice agriculture, about 3,000 BC, swathes of wildwood were cleared for farmland, and the wildwood began to be exploited for the woodland products needed by the farming communities. Buildings were made of timber and heated by wood-burning fires, farmers used wooden fences, blacksmiths used charcoal; wheels, wagons and tools were mostly wooden - in short all kinds of woodland products were required. Over the succeeding millennia great quantities of wood were consumed, the wildwood was over-exploited, and it became necessary to manage and conserve woodland. The trees in a managed wood were felled when they reached a certain height, and natural regeneration from seed or rootstock was encouraged. For this to succeed, grazing animals had to be kept out, so such woods were surrounded by a woodbank, a ditch-and-bank earthwork with a fence on top. In Anglo-Saxon England woodland was considered a valuable resource. At the time of the Norman conquest the importance of woods was recognised by being separately recorded in the great survey of England known as the Domesday Book. The Domesday Book gives woodland two leagues long and one league wide in the Manor of Sutton Coldfield in 1086; the whole manor was worth eighty shillings, thirty shillings of this being the value of the woodland. There is some doubt about the meaning of “league”, one and a half miles being often quoted, and the four and a half square miles of the Sutton woods may be a composite of several different areas of woodland. The largest area of woodland lay along the east side of the E Brook from Reddicap Hill to Pype Hayes (in Erdington, where it was described in the Domesday Book as being “within the King’s fence”). These were the manorial woods, referred to in 1126 as “a haye fenced”, i.e. enclosed woodland. The woodbanks surrounding these woods have mostly disappeared, but the earthwork to be seen alongside Walmley Road may be the remains of the thousand-year-old boundary of the manorial wood. 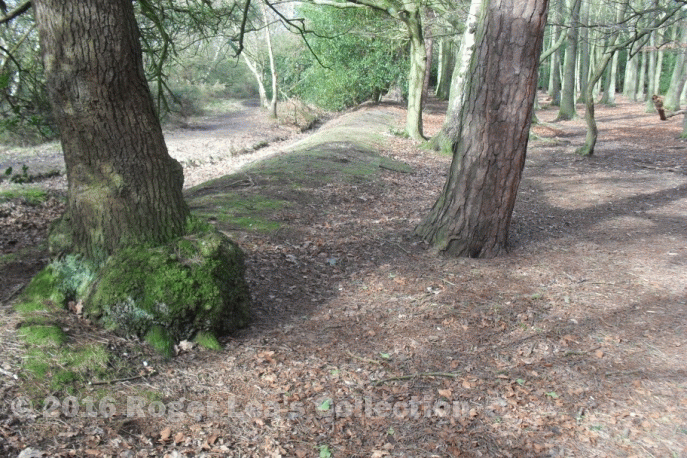 This earthwork was later used as a rabbit warren, and the area of Sutton to the east of Walmley Road was known as “Beyond the Woods” until Victorian times. The manorial woodland was converted to other uses early in the Middle Ages, and the woodbanks surrounding other woods in Sutton were in a neglected state when Sutton received its town charter in 1528. Bishop Vesey was busy turning Sutton into a thriving town, and he understood how important to the economy was a large area of productive woodland. Rather than renewing the traditional worn-out woods (which were known locally as “Hays”), he set out seven new ones in Sutton Park, using the traditional method of woodbanks to enclose them. The construction of the woodbanks with their fences on top cost him £43 2s. 6d, and these banks, the last to be made in Sutton, can still be seen round the edges of the “seven hays” - Holly Hurst, Upper and Lower Nuthurst, Pool Hollies, Darnel Hurst, Streetly Wood and Westwood Coppice.